The former capital of Provence, Aix-en-Provence, is in the Bouches-du-Rhone department and is one of the south of France’s most charming old cities. 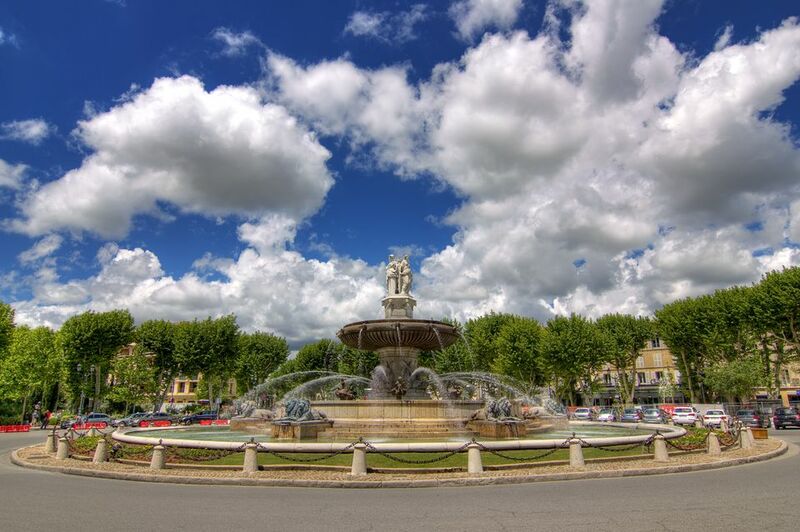 A major city in Provence, Aix was originally a Roman city and is known for its old quarter, its cultural life and its links to Paul Cezanne, the most famous Aixois painter. It also has gorgeous daily markets. The TGV Méditerranée trains to Aix-en-Provence train station leave from Paris Gare de Lyon (20 boulevard Diderot, Paris 12) throughout the day. Paris to Aix-en-Provence train station in 2hrs 59 mins. Lille (which connects with Eurostar) to Aix-en-Provence train station in 4 hrs 32 mins. Charles de Gaulle Airport to Marseille Saint Charles. Then take the train to central Aix-en-Provence train station. The whole journey takes from 4hr 59 mins. A new Eurostar service runs in the summer direct from London St. Pancras, stopping at Avignon. From here it's a quick train ride to Aix-en-Provence. The train continues on to Marseille. Other popular direct connections to Aix-en-Provence TGV include Montpellier, east in Provence directly along the Cote d’Azur to Nice, Lyon, Dijon, Metz, Toulouse, and Strasbourg. The TGV train station is 13 km from the city center. Shuttle buses take about 15 minutes. Marseille-Provence Airport is a major airport with national and international flights, including to and from New York and London. The airport is 21 km (13miles) south of Aix-en-Provence. Shuttle buses run regularly from the Airport to Vitrolles-Les-Pinchinades, Aix-en-Provence TGV train station, Les Milles – La Duranne and Aix-en-Provence city center, taking 30 minutes. MP2 is the connected airport for cheap international flights. Take the shuttle bus from the main Marseille-Provence Airport for a five-minute ride to MP2. The distance from Paris to Aix-en-Provence is around 760 kms (472 miles), and the journey takes around 6 hrs 40 mins depending on your speed. There are tolls on the Autoroutes. You will drive through the beautiful Vaucluse department of Provence on your way there. Provence is one of France's most beautiful regions and it's a pleasure to drive through the countryside, though beware of the autoroutes around the major cities. If you're driving, make sure you're comfortable with roads and driving in France. Eurolines operates a coach service from Paris to Aix-en-Provence. It also operate to other cities in Provence: Marseilles, Nimes, Avignon, Toulon, Marseille and Nice. Check the Eurolines wensite for more details. The French company OUI Bus also operates between London and Lille and London and Paris. OUIBus also goes from Lille to Amsterdam and Brussels. Read guest reviews, compare prices and book hotels in Aix-en-Provence with TripAdvisor.